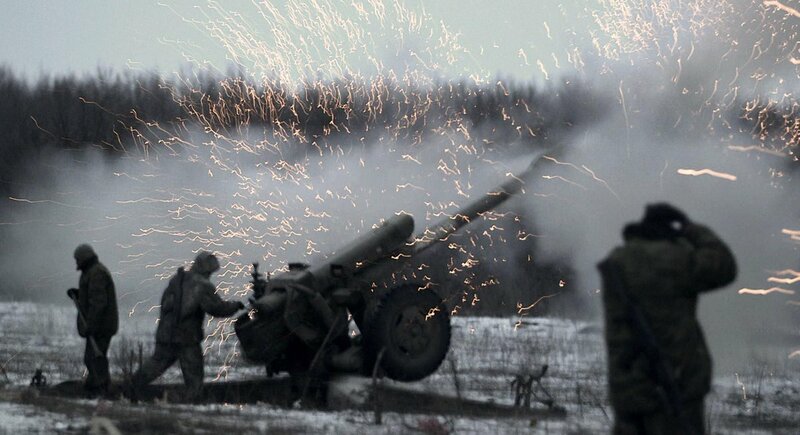 Fighting continues to rage in eastern Ukraine. (At Ukrainian positions). KRASNYI LUCH, Ukraine — Russia-backed rebels battling for control of a strategic town in eastern Ukraine say they're suffering heavy losses at the hands of government forces after a few key victories. "We [were] shelled and I'm [thinking] 'Oh my God, this is too close,'" said Artur, a rebel lying in a bed in Krasnyi Luch City Hospital, some 22 miles from the town of Debaltseve. "I only remember that roaring sound of incoming mortar [fire], explosion, dust and suddenly it became very dark." Carnage surrounded the fighter when he regained consciousness in the forest outside town. "I'm looking around — pieces of meat everywhere, just pieces of meat, some bodies ... [were] just laying there," he said, requesting that only his first name be used. Artur, a wounded rebel soldier, is being treated in hospital. Three members of his ten-man unit were killed in the confrontation, and four injured, including Artur, who was shot in the shoulder as he tried to avoid incoming fire. Artur and his comrades aren't alone. Since Monday, more than 70 fighters have been treated at this hospital alone — a major increase, according to staff. Staff say they don't know how many fighters have been killed. In nearby Krasnyi Luch City Hospital, two rebels who did not want to be named said they had witnessed an increased number of casualties. The recent escalation in violence comes as separatists intensify their offensive against Ukrainian forces near rebel strongholds of Donetsk and Luhansk. Taking control of Debaltseve would allow the rebels to control important road and rail connections, and may even prove a turning point in the war. Many Ukrainian government supporters, meanwhile, fear a massacre if rebels take control of the city. Worsening relations between NATO and President Vladimir Putin, who accuses the West of promoting a policy of "containing" Russia, form the background of this worsening violence. For their part, Ukraine and NATO say Russia is sending soldiers and weapons to eastern Ukraine to support separatists, a charge Moscow denies. More than 5,000 people have died since fighting broke out in April, and a September cease-fire has failed to contain the violence. Both sides accuse each other of being behind a recent flare-up, and rebels say this intensification has taken a major toll. These setbacks are creating divisions among rebel troops, the rebels say. "I'm a little bit demoralized because so many guys suffered, a lot of guys I used to know [were] killed," Artur said from his hospital bed. A Russian separatist leans his rifle on his knee while patrolling the front line near the eastern Ukrainian city of Debaltseve on Wednesday. A rebel fighter in another room also described intensifying fighting during a battle over a rail hub about 18 miles from Debaltseve. "On the way we faced intensive resistance [from] the Ukrainian army, we had to fight back ... others were also wounded but I don't know where they are," said the separatist, who did not want to reveal his identity for fear of retaliation. He was shot twice in the leg and shrapnel is embedded in his back. But he was lucky — many other fighters did not survive, the rebel said. "Losses were big," he added.